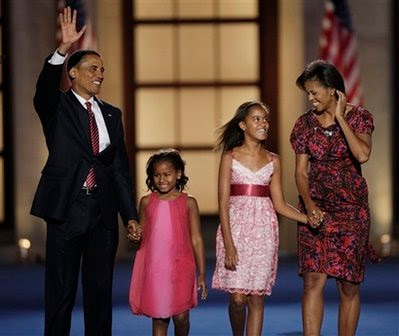 Some Quick Thoughts About Barack Obama's Acceptance Speech at the Democratic Convention... | BlackRadioIsBack.com - Official Blog of the Syndicated FuseBox Radio Broadcast! Just finished watching American History in the making, flipping between C-Span, PBS and MSNBC along with numerous instant messages from friends and family. Now I am typing this while talking to Mama Fusion on the phone about what went down. Senator Barack Obama has officially accepted the Democratic Party's nomination to run as President of the United States - the first Black American who has gone this far in such as race with one of the major political parties of this country. Without question, that deserves congrats and props. One of the first things I can say is Senator Obama did hold his own during the speech and truly made things happen in breaking down the "Change" theme of his campaign for mainstream American folks. Whatever political party you belong to, you would have to be a serious hater to say that the man can't rock a platform and talk that talk (whether you believe the oratory or not, is on you - one of the wonderful things of what a democracy is supposed to be about). There is no way in icey cold Hell (I like warm weather, so Hell for me is cold) that Republican Party nominee Senator John McCain is even going to be able to top that aspect of the political race. Secondly, after watching this speech am I the only one who feels that it is about damned TIME that Barack let loose and went after folks talking smack about him?!? For real, after a year of being pretty laid back and silent, wouldn't you be ready to let loose and rip a new body part into someone? That was probably one of the most professional "F*** y'all" moments I've seen in my life and I'm sure that Obama's speech writers (or him) were smiling HARD when some of those lines were put up in there. On a deeper level, it shows that the bro has gotten (if did not already have) some backbone to deal with the other side. Now as voters and citizens, we can acknowledge that history as been made and feel cool about that. Now, it's time to follow through to the next step. Whoever gets in voted into/placed in office as President of the United States - we as individuals and the community at large have to uphold our responsibility to make all politicians from the top down accountable for what they say, what we do and to enact what we want to make things proper, period. Like we always advocate at BlackRadioIsBack.com and the syndicated FuseBox Radio Broadcast, make your vote an educated vote when you exercise that right. Democrat, Republican or any of the Independent/Third Political parties - all votes count when you know what you're standing behind. And also, make sure your vote counts on a numerical level in this country any way you possibly can - remember the mess of 2000 & 2004 which left us in the bugged out conditions we have today with 8 years of G.W. Bush on the homefront and beyond. Well, going to continue packing for this vacation for the next few days...y'all have a good weekend!